Leicester City were promoted to the Premier League after a combination of results in the Championship on Saturday went in their favour. City, who beat Sheffield Wednesday 2-1 on Friday, needed Queens Park Rangers to lose at Bournemouth and Derby to fail to win at Middlesbrough. The Rams lost 1-0 while Rangers suffered a 2-1 defeat. 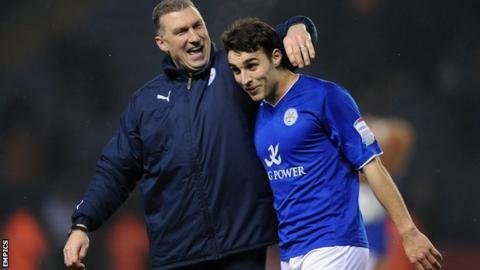 It means Nigel Pearson's Leicester will line up in the top flight for the first time in 10 years next season. "It's unexpected. I didn't think the results would go our way today," Pearson told BBC Radio Leicester. "I think it's a relief for a lot of people. It's been a tough couple of years in the sense that we've been trying to get back into the top flight and it's never easy. "We're in Shropshire at the moment and on the way over my wife and daughter wanted to listen to the radio and I said 'no'. "They were texting each other in the car to keep each other up to date. "I found out when we arrived and it was rather nice. It's been an interesting two or three hours." The Foxes have earned their place in the Premier League with six games of the season remaining having won 27 of their 40 games so far. Goalkeeper Kasper Schmeichel said: "If feels great. It's an amazing achievement. We are all very, very happy and it's a great day for everyone at the club. "What we wanted all along was promotion. Leicester have scored more goals, 76, than any other Championship team, and conceded 38. City have kept 14 clean sheets in league matches. Only two players have been sent off in 2013-14 - Paul Konchesky and Matt James. David Nugent (18) and Jamie Vardy (16) have scored more league goals (34) between them than Charlton (27) have managed in total. Nugent and Kasper Schmeichel have been ever-presents for Leicester. "It's a day for celebration. These type of things don't happen very often, but there are still six games and we still want to win the league so we have to keep working and keep going. "But obviously we will have a good night and celebrate and get back to work on Monday morning." Schmeichel, who joined City in 2011 but is out of contract in the summer, was quick to praise Pearson and said he wanted to sign a new contract. "I can't speak highly enough of Nigel - I really can't," the Dane said. "From day one he has been brilliant. He has his way of doing things. He took a bit of time to change things around and mould it to how he wanted it - and this season he has got it exactly how he wanted. "It just goes to show that he was spot on with his decisions. "I am so happy for everyone in the team and the whole coaching staff. There are a lot of people behind the scenes who don't get the credit. "The Premier League is where I want to be - there is no question. I enjoy playing at Leicester. At the moment is is not really up to me but I hope to stay." Other Leicester players - past and present - took to Twitter to celebrate their promotion. Forward Gary Taylor-Fletcher said: "We are Premier League, say we are Premier League! Get in." Ex-Leicester and England striker Gary Lineker, who scored 95 goals for the Foxes, tweeted: "Leicester City are promoted to the Premier League. A sentence I've been waiting to say for 10 years."